Mahalia is supposed to be having a day off. Instead, she's spent most of the afternoon on a conference call about her debut album, and now she's being submitted to a gruelling BBC interview. "You're totally not interrupting me at all," she laughs. "I'm just making a cup of tea." Bright and chatty, the 20-year-old is getting accustomed to a busy schedule. In the past couple of months, she's won YouTube's One To Watch award, been nominated for a Brit, and toured the US with fellow soul star Ella Mai.... but she's far from an overnight success. Born Mahalia Burkmar in Leicester at the turn of the millennium, she started playing guitar and writing songs as a child, and was signed to Atlantic Records when she was just 13. Her first EP, Head Space, emerged a year later, followed by guest slots with Rudimental, a role in Noel Clarke's 2016 film Brotherhood and a tour with Ed Sheeran. In some respects, then, that debut album is long overdue. "It's been a weird journey, actually," she says. "At first I was purely this girl with a guitar and I was like, 'God, I'm not sure I want to be a singer-songwriter who tours on her own'. So I had to work out how to find new sounds and new sonics and make it somehow a fully-formed thing. "But around two years ago, I kind of worked it out and now I feel really confident in the music." The breakthrough was Sober - a song about her tendency to drunk-dial her ex that, brilliantly, Mahalia wrote while she was "a little tipsy" and trying to stay away from her phone. Released in 2017, it's her most-streamed song on Spotify and her most popular hit on the lyric website Genius, where a quarter of a million fans have looked up the words. "When I was writing it, I definitely didn't think, 'Everyone's gonna relate to this,'" she says. "I was feeling a certain way and needed to get it out - but of all my songs, it's definitely the one that's had the most covers, so there's something about it that's relatable." Musically, Sober set Mahalia's languid, jazzy vocals against brushed keys and a rippling synth bass. It marked a massive departure from the acoustic soul of earlier tracks like 17 and Marry Me, but it instantly felt right. "It was the first time I felt like a song had every single part of me within it," she says. "[It had] my weird melodies and lyrics and that R&B feel that I knew I loved, but couldn't find on the guitar alone. "It just took me a second of not thinking too hard, I think." Since then, the singer has gone from strength to strength, showcasing a knack for wry, observational lyrics ("I wished I missed my ex"), silky soul beats and the sort of stage presence that can only be earned with seven years' practice. Her latest single Do Not Disturb is the inverse of Sober - with Mahalia shutting down needy texts from a persistent boyfriend and carving out some time to herself. "With phones, everybody always has easy access to you," she explains. "And it's really difficult to deal with, especially when you're trying to get over somebody and they call or text or email or send a DM. "It's like, 'Oh my God, leave me alone!' So when I was writing that song, that's what I was trying to tap into. I'm going to put myself on do not disturb as well as my phone." But her most personal song is Proud Of Me - which looks back at her childhood in Leicester and the people who supported her dreams. "I've never been religious/Instead my momma showered me in kisses," she sings with a distinct Les-tah accent. "Thirteen with the big dream and Daddy said I could be anything." Music was a constant in the family home, and she clearly remembers trying to emulate her father's guitar skills. "My dad was totally that kind of cliche superhero in my life, so I used to look at him and be like, 'God I want to be like you,'" she says. Further inspiration came from her high school teacher Mr Hill. "He was the one who'd come to get me from my English lesson and take me to my guitar lessons because I'd forgotten," she says. "And he's the one who'd stay around after school and teach me to read music. "I don't think he really knows how important he was." Proud of Me doesn't just look back at Mahalia's formative experiences, it sets out her manifesto for fame: "I wanna keep bits of me to myself/I don't need your publicity all up in my business/That right there is a sickness." "I definitely like to keep my personal life to myself," she says. "But I mean the silly bits, like the drunken bits, or the bits at home, or the arguments with my boyfriend or my friends. "But anything I can do creatively, no, I want everyone to have that." 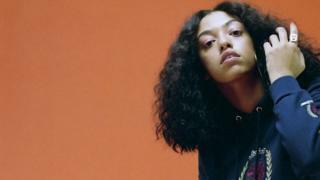 In 2019, Mahalia's getting a helping hand from BBC Radio 1, which has put the singer on its Brit List - guaranteeing her next three songs a place on the station's playlist. Previous recipients include Stormzy, Anne-Marie, Lewis Capaldi, Sam Fender and Mabel, so it augurs well for the young singer as she finishes her debut album. As she sets off on a short UK tour this week, she's "literally in and out of the studio" every day, "tying up loose ends and making sure it's perfect". "I'm still climbing up the hill and I'm nearly at the top." And what about the drunk texting - is that all a distant memory now? "Oh no," she laughs. "I still wake up with beer fear at least once a month." Mahalia plays in Manchester and London this week. Her debut album will be out later this year. BBC Sound of 2019: Which rising stars have made the longlist?